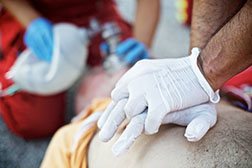 Were you looking for First Responder Injuries lawsuits? Lawyers are investigating potential lawsuits alleging first responder misconduct in their handling of issues involving the public. Among concerns regarding first responders is that a lack of proper training of police and other first responders can result in injury or harm to the public and that some members of the police commit acts that amount to abuse of the public. Such police misconduct--or police abuse, can result not only in serious injury but also death of the victim. Send your First Responder Malpractice claim to a lawyer who will review your claim at NO COST or obligation. First responders are the people who are trained to be the first to respond to an emergency and assist people as needed. They typically include police, fire, and EMTs (Emergency Medical Technicians). Some first responders are certified and all are trained in specific areas of assistance in case of emergency. Most first responders are highly professional and well equipped to deal with emergency situations. Some jurisdictions, however, may not provide adequate training for their first responders, or may lack proper policies and procedures to ensure all activities are carried out in the safest possible manner. Even in jurisdictions where first responders are sufficiently trained, large-scale emergencies (such as a hurricane) can cause lapses in protocol. In some cases, despite proper training and adequate guidelines, some first responders fail in their duty to the people who need assistance during an emergency. This puts the health, safety, and lives of the public at risk. In 2015, a $7.7 million wrongful death lawsuit was filed against the D.C. Fire and EMS Department on behalf of the family of Medric Mills Jr., who suffered a heart attack across the street from a fire station. According to The Washington Post (6/3/15), although bystanders ran to the fire station to ask for help, they were incorrectly told that first responders could not be sent until someone called 911. Mills later died. Although most police are honest, hard-working individuals, there are members of police forces who violate the ethical standards they are required to uphold. While some violations are done on an individual basis, others may be the result of institutional problems that affect many members of a police force. Among allegations made in police misconduct cases include: wrongful death, excessive force (including excessive Taser use), assault, sexual misconduct, and battery. According to the 2010 National Police Misconduct Statistical Report (from The CATO Institute), from January through December 2010, there were 4,861 unique reports of police misconduct involving 6,613 sworn law enforcement officers and 6,826 alleged victims. During the same period there were 247 fatalities associated with the tracked reports. In April, the Los Angeles Police Commission ruled that the shooting of a homeless man by a police officer was unjustified. Even in situations where the police officer is cleared of criminal charges—or does not face criminal charges—a civil lawsuit can be filed if a member of the public has suffered harm. The city of Chicago reportedly agreed to two settlements totaling $6.45 million. The settlements involved two cases alleging police misconduct, including one in which police officers were accused of using excessive force against a mentally ill man who later died. According to The Guardian (4/13/16) police used a Taser 13 times on Philip Coleman. Although he died from a reaction to a drug given while in hospital, Coleman reportedly experienced severe trauma during the incident, including extensive bruising and scraping. In Illinois a recent lawsuit challenged first responder immunity from lawsuits, with the Illinois Supreme Court, in a split decision, ruling the "public duty rule" should be overturned according to the Cook County Record (1/22/16). Victims may be able to file lawsuits against first responders or their employers if their actions—or inactions—cause injury. First Responder Medical Malpractice Lawsuit i..
‘Groundbreaking’ First Responder Negligence V.. Denied Workers Compensation Claims Always Des..
Failure to Train is Core of Police Shooting P..
On February 27, 2015, I checked myself in to the ER at Alta Bates Hospital in Berkeley for counseling services. I was very very upset and anxious because I had just had a confrontation with my nursing professor that had the potential to alter the course of my record as a top nursing student. From the moment I was called in the waiting room, and for the next 3-4 hours, the staff did not say a word to me. In the waiting room, I was calm and gave no probable cause for what happened next. The hospital workers dragged me through the waiting room, immediately placed me in confinement meanwhile failing to communicate to me what was going on. They physically abused me. They violated every single one of my patient rights. Only one hospital worker did not engage in abusive behavior. He is the one that told me everything that happened to me was caught on surveillance video. I now know that my treatment by the hospital staff was directly related to my nursing professor's retaliation. However, whatever the reason, hospital staff never has the right to outright abuse patients when the patient has given them no probable cause to do so. Since I checked myself in, I should have had the right to leave at any time or at least to be told why I was being held. Soon after entering into the ER, I called the Berkeley PD and told them where I was and that I needed help. The hospital staff violently grabbed the phone from me and confiscated the rest of my belongings. The police never responded. Later, when I tried to press charges against the criminal abuse and false imprisonment, they refused to look into the matter. According to the Berkeley Police, they never ever investigate allegations of criminal activity in Berkeley Hospitals, giving the hospitals full discretion in such matters. Alta Bates hospital refused to allow me to view the videotapes without a subpeona from the DA- which could only happen if the police opened an investigation. They acknowledged the call I made from the hospital, but said that I probably deserved it and that the entire staff would simply echo the same story. Those videotapes would have told quite a different story, and there was one person on that staff that may have been willing to blow the whistle. If the hospital did nothing wrong, then why did that lone security guard tell me about the videotapes, and why were those tapes withheld and then destroyed? The Berkeley Police Department should have been the first responders in this case. If this had happened in any other city, the people that assaulted and confined me without giving me informed consent and without being given probable cause would have been charged with crimes. They did this because they new they could get away with it. They treated me like an animal and denied me of all my patient rights. If the police had responded they could have put an end to what went on. The hospital would have had to explain to me why I was being held and confined, and they would have had to answer to their constant and uneccessary use of brute force. I should mention that I am 5 feet tall and weigh 98 pounds.